I read and watched Sophie's Choice as part of Doing Dewey's Book to Movie Challenge. This was one of those stories that I'd always heard about, but never gotten around to reading or seeing the film. 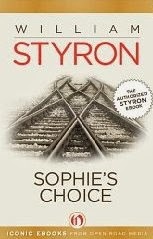 I already knew what the 'choice' was, so I was intrigued to find out how and why Sophie made said choice. I must admit I found this novel hard to read, and not just because of its tragic subject matter. Styron's style of writing was definitely not to my liking. He rambles on quite a lot, often going off on tangents just when he's about to reveal something interesting. I understand he did this to create tension and as a way to keep the reader captivated and desperate for more, but unfortunately all it did was make me annoyed. It took me until halfway through the novel to even begin to engage with the story. I imagine that a reader who wasn't already aware of the 'choice' might actually enjoy Styron's style, but for me I found the eventual reveal at the end of the novel very disappointing. I felt let down by all the time I'd put in to get to this vital event, and then it was over in a flash. I expected more from this classic piece of literature. As I read I realised that Sophie's story was all that mattered to me. Her life before the war and her time in Auschwitz was gripping and thoroughly heartbreaking. While I like the narrator Stingo, I didn't care as much about him and his sexual misadventures. Where the story grabbed and held my attention was in the many scenes where Sophie's memories were recounted. The book deals with a wide range of topics such as guilt, injustice, racism, discrimination, mental health issues, drug misuse, suffering, violence and inhumane acts. A very depressing novel indeed! But then any story dealing with the Holocaust is a sad one, so I wasn't surprised by the dark and heavy themes. Sophie's Choice is definitely one of those stories you'll never forget. I enjoyed the film a lot. The movie is faithful to the novel's major plot, but manages to tell the same story much more concisely. I struggled through the novel because Styron wrote page upon page to get a simple point across. Alan J. Pakula's script, on the other hand, made very good use of dialogue and visuals to portray an emotion onscreen. In that respect I found the film to be a much better medium to tell this particular story. Meryl Streep is most definitely one of the best actors of all time, and she is nothing short of extraordinary in this film. Not only does she do the entire movie with a Polish accent, but she also speaks flawless German and Polish is those vital flashback scenes. I could not fault one bit of her stunning performance. And to know she did the 'choice' scene in one take only serves to cement the belief that we're witnessing a truly phenomenal actor at work. Kevin Kline and Peter MacNicol were impressive as well. They did bring Nathan and Stingo to life for me, but just as it was Sophie's story in the novel that gripped me, I found myself too caught up in watching Meryl to give either of the male actors much attention. Something I did notice was the setting - the house in which the three friends live was beautiful and haunting in its own way. It provided the perfect place for their joyful summer antics and their equally disastrous fights. Likewise, the music gave a real sense of regret and heartache to the narrative. This is a powerfully emotive film that was able to make me cry where the novel didn't. Watching the 'choice' scene, and the others set in Auschwitz, really brought home to me the horror of the Holocaust atrocities. Even though Sophie's Choice is a work of fiction, to know that there were many who lost their loved ones during these terrible times is almost too awful and heartbreaking to bear. Sophie's Choice is one of those tragic stories that I believe everyone should watch (or read) at some point in their lives. It touched my heart and I'm glad I gave it a chance. I first watched Sophie's Choice as soon as it went to DVD (we lived in the country, no cinema)I hadn't read the novel and I had no idea about the story line or indeed what the choice would be. I remember how profoundly disturbing the whole story was, I had two small children at the time. Meryl Streep has been my favourite actor ever since.